The newest condominium tower in midtown Manhattan’s billionaires district is ready to open its doors to buyers. It took almost a decade to get there. The skyscraper at 53 W. 53rd St., designed by French architect Jean Nouvel and rising next to the Museum of Modern Art, will start marketing its 139 apartments next week, with prices starting at $3 million. Planned since 2006, the project endured the real estate bust and a global financial crisis that decimated demand for luxury homes. Now it’s emerging when buyers can’t seem to get enough of them. The project’s latest challenge: competing for buyers with about a half-dozen other luxury condo towers that are under construction nearby. The developments—including Vornado Realty Trust’s 220 Central Park South and Aby Rosen’s 100 E. 53rd St.—are transforming Midtown neighborhoods known for hotels and corporate offices into communities of wealthy people from around the world who are hungry for large living spaces and panoramic views. The 1,050-foot (320-meter) tower, the size of the Chrysler Building, will rise near the corner of Sixth Avenue between 53rd and 54th streets, on land once owned by the adjacent museum. MoMA will expand its galleries in the bottom three floors of the residential building, whose signature architectural flourish is a web of diagonal concrete beams that gird the structure from the outside before tapering into a pinnacle more than 82 stories into the sky. “It is the flag—not only of the building—but the flag of the MoMA on the skyline,” says Nouvel, who also designed a Ferrari factory in Italy, an art museum in Abu Dhabi, and a 23-story condo building near Manhattan’s Chelsea waterfront. Unobstructed views of Central Park, five blocks away, start on the 48th story, which is where the building’s larger half-floor units also begin, according to Penick and preliminary plans filed with the New York state attorney general’s office. The most expensive apartment, a 6,643-square-foot (617-square-meter) duplex spanning the 81st and 82nd floors, will be priced at more than $70 million, Penick says. Smaller one- and two-bedroom units on the lower floors will have views of the Midtown skyline. The least-expensive condo is a one-bedroom of about 1,450 sq. ft. on the 17th floor; it will be listed for sale at $3 million, according to Penick. Every apartment is shaped a little differently because the building’s exterior support beams cross the floor-to-ceiling windows at various angles, Nouvel said. It made for an interesting design challenge. Amenities at the tower include a movie theater, a private dining room overlooking Central Park, and temperature-controlled wine vaults. Residents can buy studio apartments on the 14th through 16th floors for their personal service staff. The project was conceived in 2006, before Houston-based Hines acquired the site from the museum for $126 million. The tower—initially planned to be 200 feet taller, about the height of the Empire State Building—was shelved amid the credit crisis, which brought property sales to a near standstill and made construction financing scarce. In 2013, closely held Pontiac Land Group helped revive the project with a $200 million equity investment. A consortium of Asian banks provided $860 million of construction financing. Hines expects to finish construction by November 2018. Manhattan’s luxury property market has soared in recent years, with wealthy investors paying ever-higher prices for trophy homes. A duplex atop Extell Development’s One57 tower sold in December for $100.5 million, a New York City record. A penthouse at Macklowe Properties and CIM Group’s 432 Park Ave., the tallest residential building in the Western hemisphere at 1,397 feet, is under contract for $95 million. 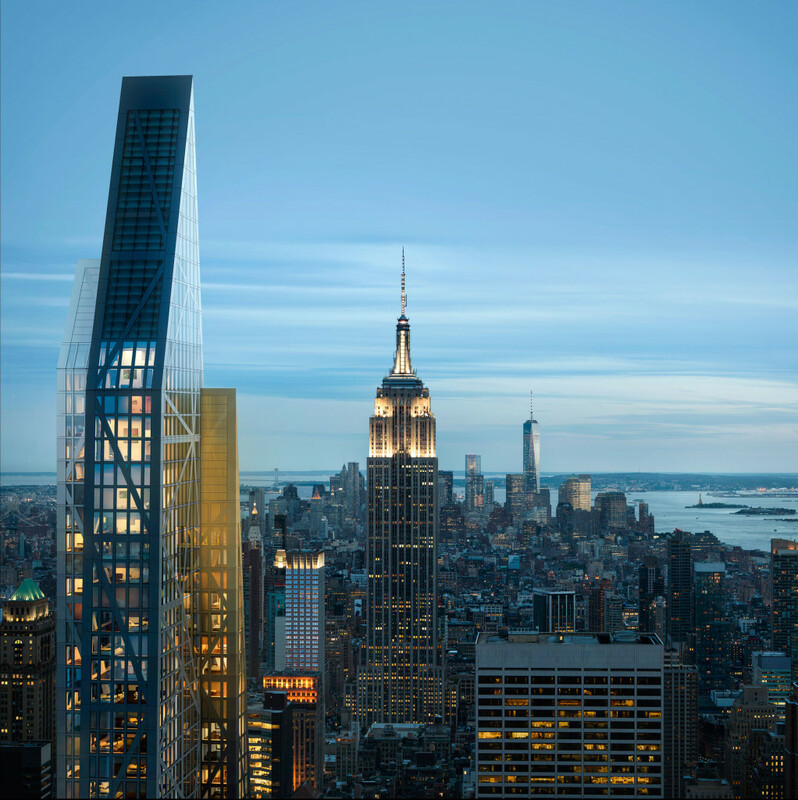 While plans for 53W53 predate those transactions, the developers always intended the project to be in an elite sliver of Manhattan’s luxury market, Penick says. 53W53 will be a new architectural monument on the Manhattan skyline.